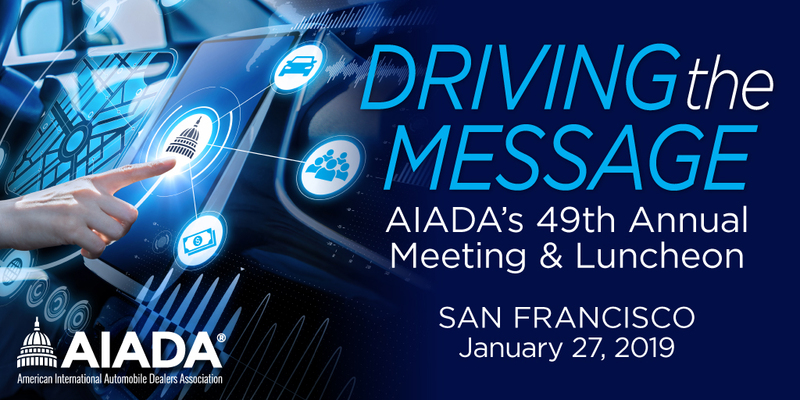 In January, international nameplate dealers gathered in San Francisco for AIADA's 49th Annual Meeting & Luncheon. The event featured the passing of the chairman's gavel from 2018 Chairman Brad Strong to 2019 Chairman Howard Hakes, remarks from Toyota's Bob Carter, and the presentation of the David F. Mungenast Lifetime Achievement Award to California dealer Dave Conant. Tariffs were on everyone's mind, as were the challenegs that lay ahead in 2019. Said Carter: "Our industry’s greatest risk remains the same: Looming tariffs and international trade frictions will impact our industry immensely [. . .] We are a global industry that supports and relies on free and fair trade." Hakes urged dealers to get involved with AIADA and attend its 2019 Fly-In on April 9 & 10 in Washinton, D.C. "If we want our stores to survive and thrive in these next crucial years, we need to be involved. We need to speak out and let our collective and our individual voices be heard and we have to do so before too much more time passes." Watch a recap of the meeting here.